The Great Pyramid of Giza from Ancient Egypt has always demanded awe and recognition from us ‘mortals’, and rightly so. The incredible architectural specimen was built in around 2560 BC and held the record for the world’s tallest structure for a whopping 3,800 years with its then-impressive height of 481 ft (146.5 m). 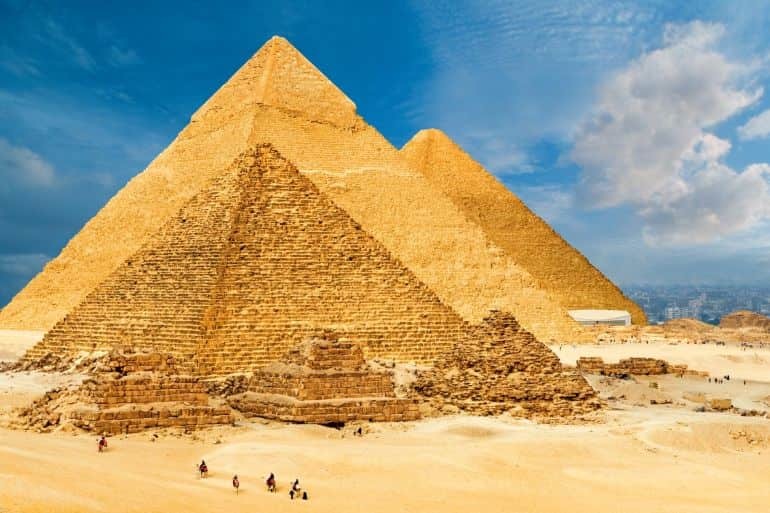 But before we get into figures and statistics, the Great Pyramid is generally believed to be constructed as a mortuary monument for Khufu (or Cheops in Greek), who was the second Pharaoh from the Fourth Dynasty. And, in spite of such ‘monumental’ projects, the one portrait of this mysterious ancient king (with a myriad of conflicting accounts of his life) survives from only a tiny 3-inch ivory figurine that was discovered in the early 20th century. The Great Pyramid of Giza was probably completed in 20 years, and as such was a part of Khufu’s necropolis complex that also consisted of large temples and smaller pyramids. Later on, the compound was expanded with the inclusion of the two other big pyramids of Khufu’s successors – Khafre and Menkaure; and the extended spatial scope is now known as the Giza pyramid complex (which had a huge wall enclosure that was known as the Wall of Crows). As for the mind-boggling figures associated with the Great Pyramid itself, the structure rises to a height of around 455 ft – the tad reduced scale being due to soil erosion and the loss of the pyramidion, which was the uppermost capstone of the structure. In spite of the slight reduction in dimensions, the monumental giant has a base area of around 570,000 sq ft (equivalent to almost 10 American football fields) and a gargantuan volume of 88 million cubic ft (or 2.5 million cubic m) that accounts for an extraordinary 5.9 million tons of mass. This massive scope was achieved by the use of a whopping 2.3 million stone blocks (ranging from 2 to 30 tons) – that comes to an average of 800 tons of stones being installed each day, with 12 stones being precisely placed every hour! Few of these stones (especially, the ones used in the inner chambers) weigh more than 50 tons, and yet they were transported to the site from Aswan, which over 500 miles away. Given such a vast scope of the construction process, and that too in an epoch which was more than 4,500 years ago – one would be inclined to think that the monument might be a bit on the surmised side with inaccurate measurements and unscientific geometry. Well, in that case, that someone will be wrong! In terms of construction, the Great Pyramid of Giza was built on an artificially flattened site that deviates from a perfectly horizontal plane by just a minute 2 cm. Even the aforementioned base edges of the structures account for an almost perfect square, thus making the corners nigh impeccably right-angled to each other. And, perhaps the most impressive feat of all – the four sides of the pyramid are almost immaculately oriented with the four cardinal directions of North, South, East, and West. In fact, the North-side alignment misses the magnitude of exact preciseness by just a tiny fraction of a degree (which equates to 3/60th of a degree of error). Interestingly enough, the base of this ancient structure is not an exact square. The figure we are talking about equates to only 5.5-inches (or 14.1 cm) of error. So when compared to the entire measured dimension of the western side, which is somewhere between 755.833 and 756.024 ft, this slight overlook by the ancient Egyptian architects rather exemplifies the scope of accuracy presented by the Great Pyramid. Simply put, the margin of error is only about 0.07 percent, which (just about) prevents the base of this monument from being a ‘perfect’ square. 3) Construction – Ramp or Hydraulic (or Both)? There are a few conjectures when it comes to the enigmatic construction process of the Great Pyramid of Giza. One of the oft-mentioned ones pertains to the ramp theory, which simply puts forth the scenario that the massive structure was built by raising ramps (or mounds) all around it. 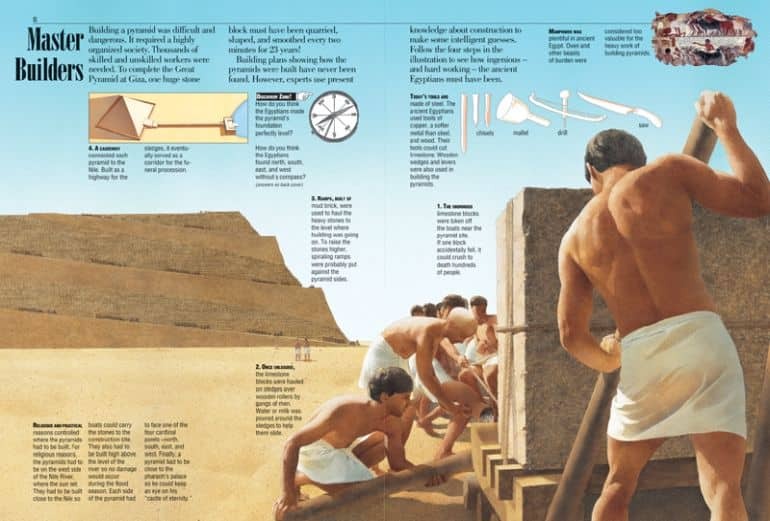 Essentially, according to this hypothesis, once the foundation was laid, makeshift ramps were constructed around the core structure to haul and position the stone blocks on top of it. As the structure gradually rose in height, the ramps were raised higher to accommodate the building blocks. The problem [with ramps] is one of physics. The steeper the angle of an incline, the more effort necessary to move an object up that incline. So, in order for a relatively small number of men, say ten or so, to drag a two-ton load up a ramp, its angle could not be more than about eight percent. Geometry tells us that to reach a height of 480 feet, an inclined plane rising at eight percent would have to start almost one mile from its finish. 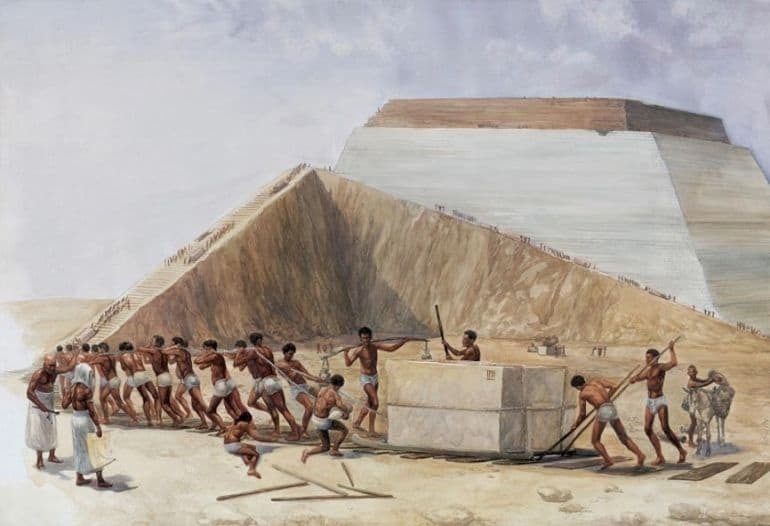 It has been calculated that building a mile-long ramp that rose as high as the Great Pyramid would require as much material as that needed for the pyramid itself – workers would have had to build the equivalent of two pyramids in the twenty-year time frame. There is also an internal ramp theory put forth by Jean-Pierre Houdin, a French architect – and it basically describes how the top two-thirds of the Great Pyramid of Giza was built by using an internal mound, while an external ramp was used for setting up the lower parts. However, this hypothesis also doesn’t explain the logistical nightmare of moving up super-heavy stones and scores of workers up the ramps at the unfeasible angles. 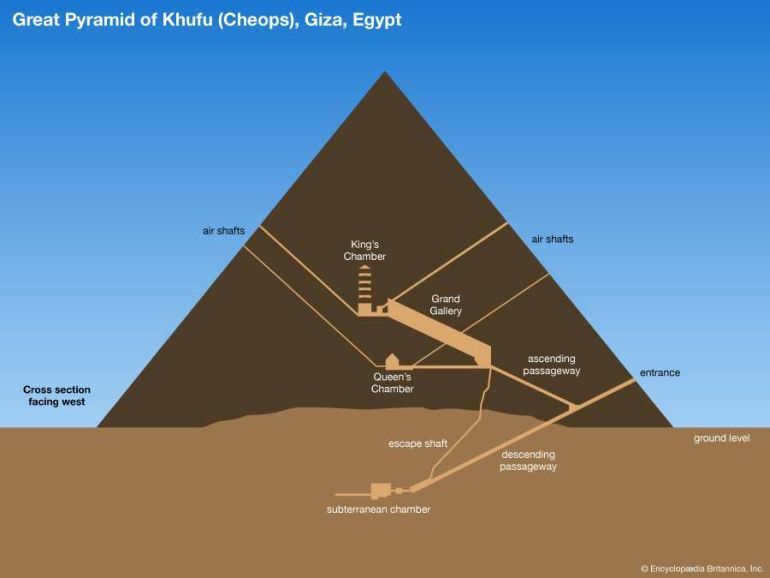 This brings us to the hydraulic power theory which simply suggests that it was water (or combination of the water table and ramps) that allowed the ancient Egyptians to hoist the stones up. For this hoisting process, they might have made use of the shadouf (a counterweight mechanism) that pulled the stones up once they were pushed by hydraulic power from below through the interior of the pyramid. Incredibly enough, this would also account for the numerous shafts within the Great Pyramid (that were possibly used as water passages). Furthermore, one should also note that the water table is pretty high at Giza even in our present times – so much so that rising water inside the underground Osiris shaft was a concern for 20th-century scholars. 4) No Kingly Remains Inside the Great Pyramid? Relating to the first point, it still remains a mystery as to why the Great Pyramid of Giza (with its ‘nigh’ fanatical austerity and accuracy) was constructed in the first place. Most Egyptologists believe that it was the grand tomb of the Pharaoh Khufu, but oddly enough the historians have still not been able to find any remains of a person or a mummy inside the intricate halls and chambers of the Great Pyramid. According to anecdotal sources, the sarcophagus of presumably Khufu was discovered in early 9th century AD by the Arabs, who forced their way into the King’s Chamber. All they found was just an understated, unadorned yet hollow granite box that was entirely empty (supposedly – without any evidence of previous disturbance). At the same time, from the historical perspective, it should be noted that the interior of the Great Pyramid was indeed a scene of robbery since ancient times. In fact, it is highly probable that the Great Pyramid (and its rich ‘contents’) had been looted even during the Egyptian New Kingdom Period (circa 1570-1069 BC) when the Giza necropolis was relegated in favor The Valley of the Kings near Thebes. As for the sarcophagus, the slightly notched ‘stone coffin’ was roughly-hewed from a solid block of granite, which alludes to an immense drilling force required for the hollowing out activity. Later studies have shown that this herculean task was achieved by using hard jewel components and a vertical drilling force of over 2 tons. However, the plain nature of the heavy coffer antithetically contrasts with the embellished specimens of (still empty) sarcophagi found in other parts of the pyramid. 5) Air-Shafts For Dead People? 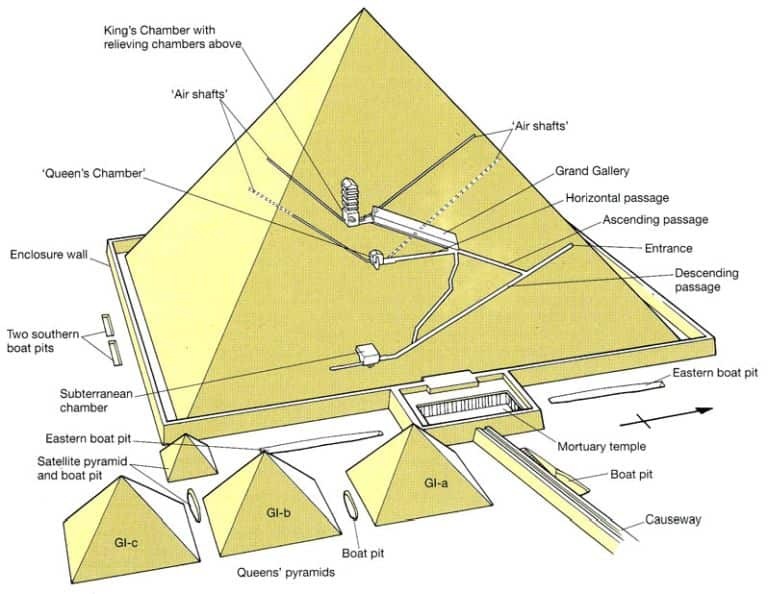 In the earlier entry, we mentioned something about the King’s Chamber – which is a rectangular enclosure that runs 17 ft on the North-South axis and 34 ft on the East-West axis and is located almost centrally inside the Great Pyramid itself. This 592 sq ft chamber rises to a height of almost 20 ft and is peculiarly connected to two narrow vent-like channels – each extending from the north and the south side walls. These shafts were long believed by Egyptologists to be air-vents that brought a fresh supply of air inside the intricately positioned enclosure. However, nowadays this assumption is dropped by experts in favor of the vents serving a more ritualistic or even an astronomical purpose (as mentioned in Pyramid: Beyond Imagination by Jackson and Stamp). For example, the south-facing shaft supposedly pointed to the star Al Nitak (Zeta Orionis) in the constellation Orion, during the period of 25th century BC (note – this idea is sometimes dismissed as pseudoarchaeology). Delving into a meta-analysis, Orion was associated with the Egyptian God Osiris. Still, the conjecture doesn’t really solve the mystery of one of the arrangements of the shafts, since this particular channel follows a dog-leg path that would have surely obstructed the direct sight of the stars. In a short film made by the Smithsonian Channel, Jacquelyn Williamson, a Harvard University Egyptologist, gives us details on how the ancient craftsmen and artisans carved and finished the humongous blocks of limestone that are also known as ‘casing stones’ for the Great Pyramid of Giza. These slanting yet flat-topped blocks were primarily used for the external facades of the monumental structure. And, according to the documentary, the stone surfaces were almost polished to perfection with a range of abrasives like sandstone, brick, and fine sand – in a process not only requiring time and effort but also refined skills of craftsmanship. The end result of such high levels of polishing yielded immaculately smooth surfaces that were incredibly shiny beyond reckoning. And, considering that there were limited pollution and smog circa 2500 BC (as opposed to our contemporary times), the Great Pyramid of Giza must have been an otherworldly magnificent spectacle during the time of its completion – with ethereal, glass-like facades basking in the glory of the effulgent sun. Quite poetically and rather aptly, the Ancient Egyptians called the Great Pyramid of Giza by the name of ‘Ikhet‘, which simply translates to ‘Glorious Light’. This mechanism in question, as described by Egyptologist Mark Lehner, the head of Ancient Egypt Research Associates (AERA), originally comprised an array of blocks and grooves that are inconspicuously hidden beneath the walls of the Great Pyramid of Giza. 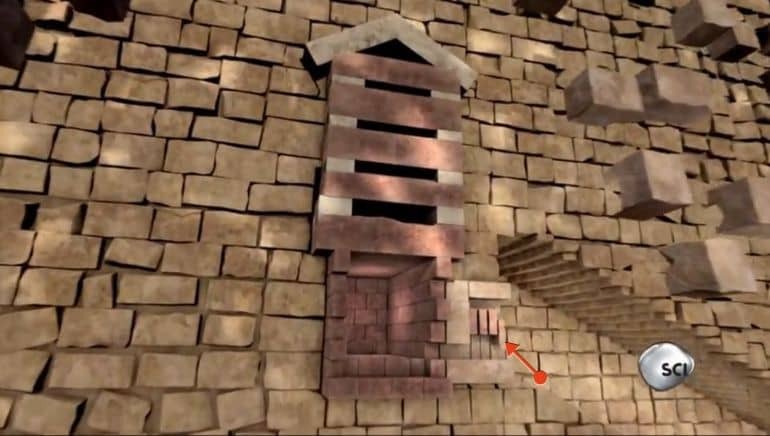 According to the virtual reconstruction (showcased by the Science Channel in their Unearthed series), these components were meticulously laid down after the king’s remains were housed inside the chamber. 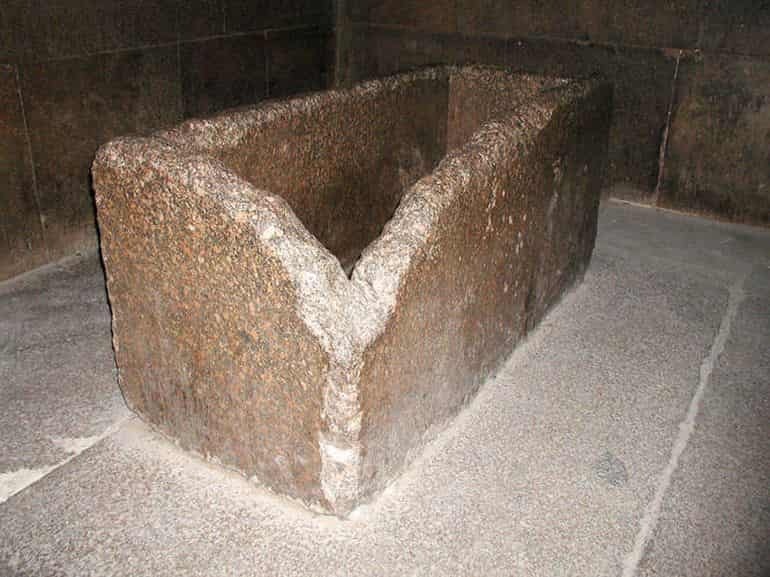 So once the pharaoh was successfully interred inside his designated King’s Chamber (that is if this was the objective of the Great Pyramid), specially-made granite slabs slid down the grooves created by specific projecting structures, thus securing the pathway to the chamber. Three bigger granite blocks were also fitted down the other end of the pathway, which blocked the access from a lower angle. And this entire structural scope of the ‘inner-sanctum’ was further accompanied by a bevy of solid limestone blocks that accounted for around 260-ft thick walls. Simply put, the ancient Egyptians went to great engineering lengths to possibly shield the passage to the King’s Chamber from future tomb robbers. But as we mentioned earlier in the article, unfortunately, the looters may have still made their way into this ‘inner sanctum’, possibly even during the ancient times itself (around a millennium after the pyramid was completed). 8) The World’s Oldest Intact Ship! Marine-based contrivances are probably the last thing to expect when viewing and admiring the sandy wastes of the Giza complex. However, in 1954, archaeologists did stumble across a 153 ft (47 m) long boat made from Lebanese cedar; and it was enclosed inside a sealed pit situated at the foot of the Great Pyramid of Giza. Known as the Khufu Ship, the marine-craft was laden with grave goods that were intended for the long journey of the deceased’s afterlife. In essence, it was envisaged as a ‘solar barge’, a ritual vessel that would carry the reinvigorated spirit of the Pharaoh across the heavens with the sun god Ra as his ‘mate’. Other boat specimens have also been found buried inside the complex, with presumably similar ritualistic purposes of afterlife journeys. However, the Khufu Ship still remains the largest and the oldest of these discovered specimens, with its whopping 2,860 sq ft area. 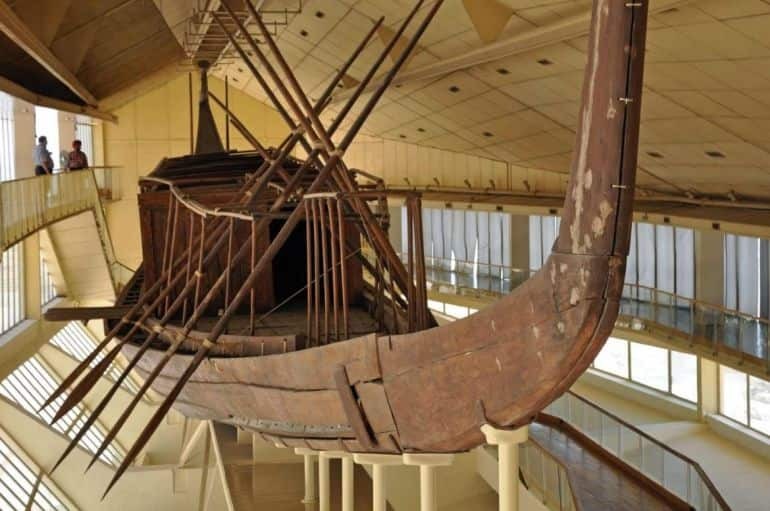 In fact, the monstrous ‘artifact’ is actually the world’s oldest intact ship from antiquity, with the preserved remains still proudly displayed at the Giza Solar boat museum. The sheer size and impressive scale of the Great Pyramid of Giza stand testament to the organizational skill and effort of the ancient Egyptians. And according to most academics, the incredible project, overseen by the vizier (who was usually tasked with the royal architectural endeavors) probably involved paid labor, as opposed to slaves (since no such evidence is found in the literary records). These laborers – numbering in thousands, possibly comprising seasonally-employed peasants, were gathered from the various parts of the Egyptian realm, and they were accompanied by batches of skilled craftsmen and builders. According to some academic estimates, the men were divided into zaa (division) of 20,000 laborers who were further organized on basis of hierarchy and their skills. Multiple such zaa possibly worked throughout the years to complete the massive undertaking. 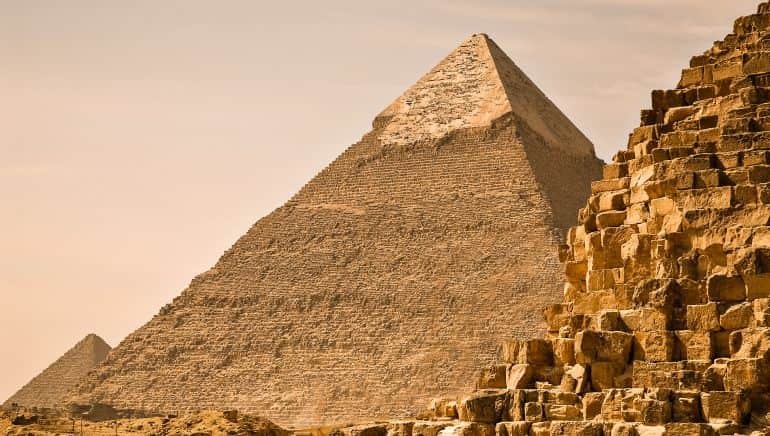 Interestingly enough when it comes to the logistical side of affairs, in 2018 itself, researchers from the Ancient Egypt Research Associates (AERA) were able to identify two 4,500-year old houses near the Giza Pyramids – corresponding to the time when the Pyramid of Menkaure (the smallest of the three pyramids) was under construction. These structures, located in the ancient port at Giza, were built for officials who looked after the supplies needed in the area. The houses were built near a series of quarters known as the galleries. These galleries housed a government-sanctioned paramilitary force at Giza, possibly comprising over 1,000 men. In other words, the officials were probably posted at Giza to look after the requirements of these troops and by extension that of the workers involved in the construction of the Giza pyramids. Suffice it to say, their jobs were anything but easy. According to an estimate made by Claire Malleson, an archaeobotanist with Ancient Egypt Research Associates, over 870 kgs (1,900 lbs) of emmer wheat was needed on a daily basis to sustain the force stationed at the galleries. We also know from ancient logbooks that around 4 liters of beer (in its gruel-like form) were assigned daily to individual laborers working on the Great Pyramid (that preceded the Pyramid of Menkaure by less than a century). The builders of the Great Pyramid of Khufu aligned the great monument to the cardinal points with an accuracy of better than four minutes of arc or one-fifteenth of one degree. All three pyramids exhibit the same manner of error; they are rotated slightly counterclockwise from the cardinal points. It should be noted that there are numerous hypotheses put forth by scholars and researchers when it comes to the alignment factor of these pyramids, with some of the conjectures based on the pole stars and others based on the sun path and shadow. Even equinox measurements were also considered by a few experts, though their assessments were relegated due to the presumed inaccuracy of the conditions. However, Dash has proven that autumnal equinox could have indeed played a crucial role in determining the alignment of the pyramids. To that end, his experiment utilized a rod known as a gnomon that was placed on a wooden platform on September 22, 2016, thus coinciding with the day of the autumnal equinox (on this day the plane of Earth’s equator passes through the center of the Sun’s disc, and the length of day and night tend to be equal). The positional change of the rod’s shadow was then tracked throughout the day, and it was found to move along a smooth curve trajectory. A straight line between two points on this curve nearly presented the east-west alignment, in a method known as the Indian circle (as pictured above). Quite intriguingly, there is a degree of error in the counter-clockwise direction in this procedure, and the similar degree of error is also found in the alignment of the aforementioned pyramids. On the literally brighter side, according to Dash, the technique would obviously require a more-or-less sunny day, a conducive weather pattern that is usually found at the Giza site. The ancient Egyptians were also aware of the annual date of the autumnal equinox by counting forward 91 days after the summer solstice. And moreover, this method seems to be relatively straightforward and uncomplicated, which would have made it ideal for massive construction projects. But unfortunately, while the hypothesis is sound, archaeologists still don’t possess any actual physical evidence of the alignment method used by the ancient Egyptians. The Great Sphinx of Giza might be dwarfed by the trio of pyramids, but the limestone specimen with its human head and lion body still remains the world’s largest monolithic statue, and also our planet’s oldest known monumental sculptural piece! To that end, the statue measures 241 ft in length, 63 ft in width and an impressive 66 ft in height. And, as expected from the cryptic ambit of the pyramids, historians are still not sure of the actual builder of the Sphinx – with hypotheses ranging from Khapre, who was Khufu’s son (this being the official conjecture put forth by Egyptologists), Khufu himself, to a lesser known pharaoh known as Djedefre, who was Khapre’s half-brother. Such questions are aptly complemented by another crucial query – what actually was the purpose of the Sphinx? 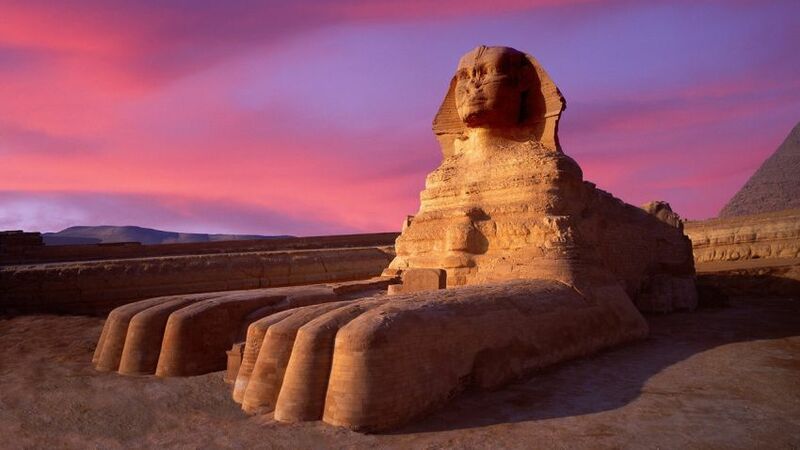 In any case, most archaeologists concur on the assumption that the facades of the Sphinx were originally plastered over and then painted in a deep red color. And, on an interesting note, in front of the Sphinx is a stele (an erect slab of granite), which records the enigmatic experience of Pharaoh Thutmose IV. According to the account of this Dream Stele, after a great hunt, Thutmose fell asleep at the feet of the statue and had a dream that asked him to clear all the sand from the sculpture, and as a wish, he would be offered the throne of Egypt. Historical events do seem to follow that prophecy, and apparently, the monument even became a place of pilgrimage during the ancient times. Book References: Ancient Egyptian Construction and Architecture (By Somers Clarke, Reginald Engelbach) / Wonders of the World (By AAA Publishing).